MPLS L3 VPN are a common standard in every bigger ISP or Datacenter for many years now and most of us know the basic principles and have experience configuring this on a normal Cisco IOS routers. But what about the new IOS XR? Well, some of us have real experience, some of us do not. 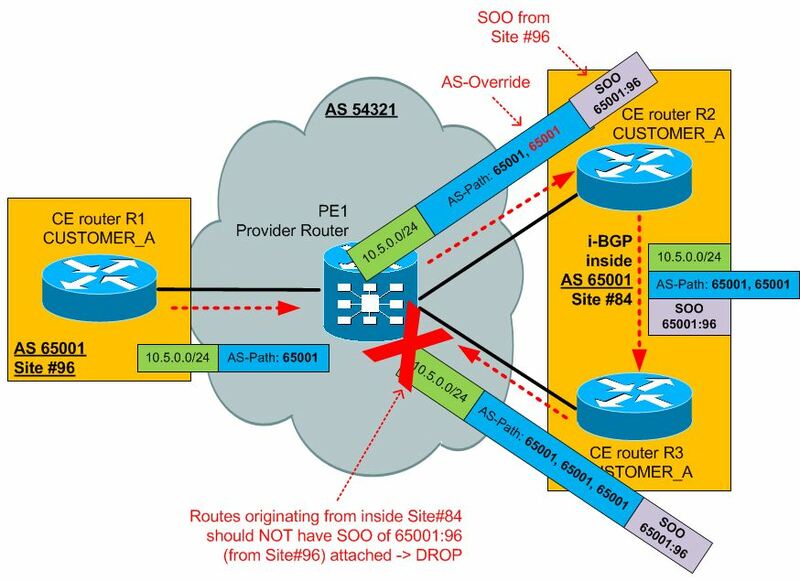 Myself, I have long had only theoretical knowledge of MPLS L3 VPNs on IOS XR and I have finally get my hand on IOS XR to try it and with this article, I will get together basic configuration for quick reference also to you. To get you a very quick start with the MPLS concept before the configuration, let me start with a basic of theory. MPLS started as a great technology to not only make switching more effective, but also it enabled with its Label Switched Paths (LSP) a way to tunnel traffic between two endpoints. The nodes (routers) in the middle of this LSP didn’t have to look at the IP header being tunneled and therefore the IP header can be effectively hidden as a side effect. With this came another idea when someone realized that you can create a VPN service with this simple and native tunneling mechanism. This kind of VPN is called “peer-to-peer VPN“, and despite the name, do not confuse it with classical point-to-point tunnels like IPSec or L2TPv2. These older technologies are called “overlay VPNs“. 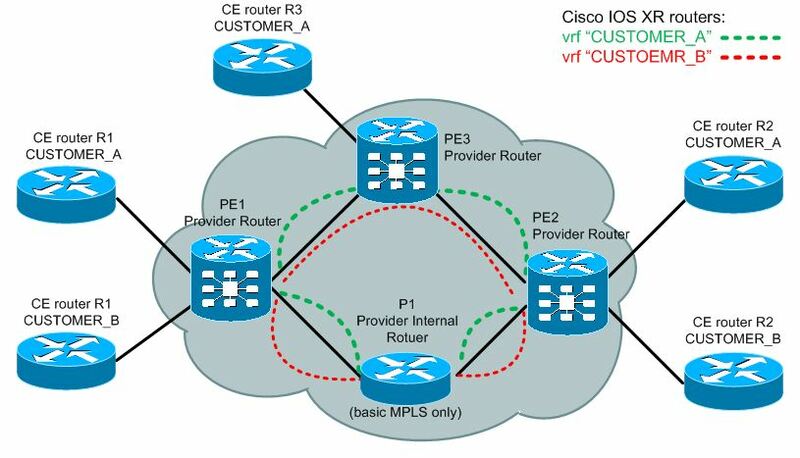 What this means is that you can interconnect multiple customers by putting them to an MPLS L3 VPN. Communicate and route their networks and thanks to tunneling and virtualization, the customer can even have conflicting subnets and there will never be a collision inside the MPLS. Below picture shows in principle the MPLS L3 VPN with two VPNs that are called “CUSTOMER_A” and “CUSTOMER_B”. The last parts of this puzzle are router virtualization and MP-BGP. Router virtualization is the same thing when you are running VMWare or Virtualbox on your PC, only that the router will spawn internal virtual routers that are in Cisco world called Virtual Routing and Forwarding (VRF) and you can assign physical or logical interfaces to this VRF to act independently. It is similar idea than a VLAN on layer 2 that is dividing switch ports to several virtual switches. The second is BGP protocol extension called Multip-Protocol BGP (MP-BGP). This is a BGP extension that allows non-IPv4 prefixes to be propagated by BGP. We will use this protocol to distribute IPv4 prefixes, but inside visualization they have to be modified by extending them with something called Route-Distinguisher (RD). RD is 64bit number that is added to the 32 bits of IPv4 prefix and together create a new address family called VPNv4. 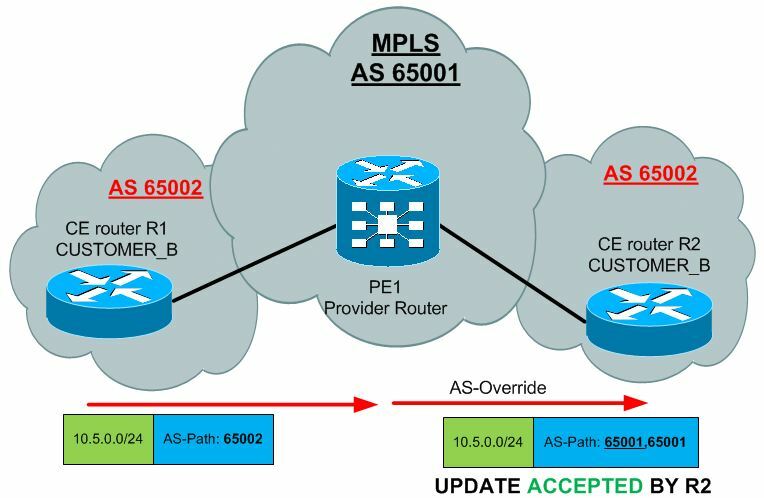 This help the MPLS L3 VPN cloud to not mix prefixes of different VPNs inside MP-BGP propagation as it is expected every VPN will have a unique RD. One additional thing to mention is the Route Target (RT), this has identical representation as RD in that it is a 64bit number, but this provides additional filtering between MP-BGP propagation and import/export of VPNv4 prefixes to/from a specific VRF. For example, by default you can simple create a unique RT for both import/export for every customer and this filter will only allow the routes of the same customer/vpn to only be imported/exported to the correct VRF. But if you need for example to have a common network area that is shared by two or more customers, you can create another VRF and import this to multiple customer VRFs by defining new combination of import/export RTs. This however is a bit advanced concept so feel free to read forward as the example below will present a simple MPLS network with a shared VRF environment. In fact, if you do not have much theory background, visit my previous article that is MPLS VPN tutorial with configuration example for HP A-Series (H3C). You do not have to read it full if you are not interested in HP devices, but the theory is there in more detail. 1) Create VRF with unique RD, import/export RT and interfaces. This guide assumes you have an MPLS network configured (minimum MPLS activated/running, internal IGP protocol and LDP sessions established). This configuration I have already presented as part of older article on basic IOS XR configuration: Cisco IOS XR – Complete Getting Started Examples Guide – Part 2/2. To propagate VPNv4 prefixes inside your MPLS cloude between the PEs, you have to configure first the basic BGP to every other PE router (or use route-reflectors/confederation that are not in scope of this article). Once basic BGP is configured, you can activate MP-BGP on top of the existing BGP sessions. I will not go in detail to all basic BGP configurations, if you need more BGP examples, have a look on my Cisco IOS XR – Complete Getting Started Examples Guide, Part 2, where BGP is also explained. You can exchange routing information between the virtual VRF router inside your PE and the CE router with most of the usual methods. You can use both static routes and also routing protocols like RIP, OSPF, IS-IS for this. To configure PE to CE communication inside only a specific VRF, you cannot however use only the normal configuration commands that you are used to. You have to bind them to the specific VRF for that particular Customer/CE router so that the routing information is only exchanged in the needed VRF context. RIPv2 can also be used to communicate with CE routers inside a VRF context. 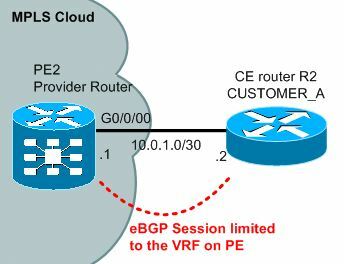 EIGRP is another example I will show to use for communication with CE router and redistribution to both import and export VRF specific EIGRP routes to MP-BGP. OSPF is another option. Here I want to state that with this configuration, all OSPF routes will appear as EXTERNAL ROUTES. 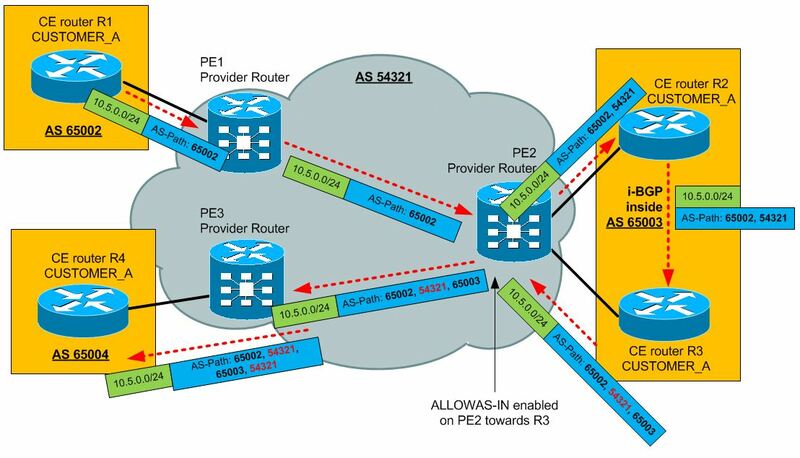 This can have major implications to the routing and if you want to simulate the MPLS cloud area 0, then you need to create something called MPLS super-backbone and two MPLS PE router will create virtual OSPF neighborship over BGP called “OSPF sham link”. However this is beyond the scope of this article (maybe some other time). And last possibility is that you can even have BGP session with the customer CE router. But again only from inside the VRF on the PE router. You can also do some minor adjustments, for example the basic one is limiting the number of BGP session that you accept from your VPN customers to protect against DoS attacks or simply wasting resources. The command below creates such limit for 1000 routes and optionally you can specify also a warning to syslog/SNMP after reaching 75% routes and the “warning-only” option makes this limit not drop routes above the 1000, and only generate a warning. With the AS path pro-actively modified to hide other customer sites, the R2 CE router can now accept the updates in our scenario. Another common issue with BGP communication is the fact the customer site can return to you an BGP update your (providers) AS inside the path. This is typically when you are trying to achieve a hub-and-spoke scenario (and you cannot avoid it). For example below, notice that the PE2 router must reject the update returning from the HUB site because it see its own AS number in the AS Path. The optional [number] parameter enables you to specify how many local AS numbers can occur in the path, if you for example set it to 3, then the update can loop three times (AS Path still OK: 65002, 54321, 65003, 54321, 65001, 54321, 65004) before it will be considered a loop and dropped. 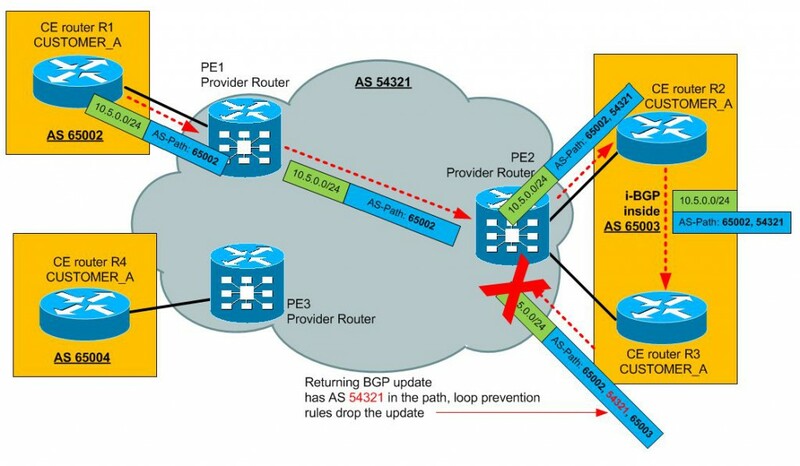 If this mechanism is configured for a particular CE (or group of CEs) and a VPNv4 route is learned with the same SOO, then this route is blocked from entering the routing table (and subsequently any other BGP update leaving the router). To demonstrate, look at the following scenario and note that for Site #96 an SOO of 65001:96 was used and for Site#84 an SOO of 65001:84 should be used. To verify MPLS L3 VPN on IOS XR a quick list of the most useful commands is below. I didn’t copied also example outputs as I was personally using various topologies and I do not have a streamlined examples. However most of these commands generate an output that is very easy to understand and by following the original goal of this article to only present a quick overview, this should be enough. I really do hope that MPLS L3 VPN concepts are already well known, but giving quick and dirty overview of a few basic features and summarizing the new IOS XR configuration will have benefits for someone reading this article. Again, I hope this has been informative. Think theres an error with the “Implementing Site of Origin (SOO) for loop prevention” example, because with the as-override should be 54321 and not 65001. Awesome article and great explanation of SOO thumbs up !!! !